Fancy some Bombay Tomato Pickle, or how about some Chocolate and Raspberry preserve? 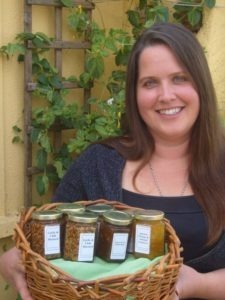 Theresa Storey’s eclectic Green Apron stall offers a fabulous range of award winning jams, marmalades, chutneys, ketchups, sauces, herb mixes, butters, mustards and pickles, all made using secret family recipes. They even sell traditional or herbal tea, grown from 400 tea bushes on the family farm. Theresa’s parents, Ed and Barbara, started in the Milk Market in 1977, selling produce from the family farm in Newmarket on Fergus, where they ran one of the first ‘sustainable living’ farms in the country. 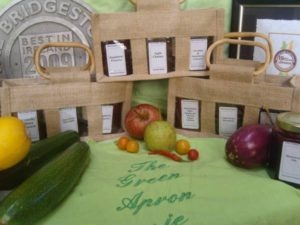 The family later moved to a farm in west Limerick and Theresa branched out with the establishment of The Green Apron in 2004. Theresa’s small Artisan Preserve company, has won seven international Great Taste Awards and 15 Blas Na hEireann Awards, and the Green Apron is listed in the McKenna’s Guide and in Georgina Campbell’s Guide. “Our small farm is situated in Derryclough, Ballingarry, County Limerick, overlooking Knockfierna, the famous fairy hill. Our preserves are made in our farmhouse kitchen. The preserves are made in small batches from home grown, wild and locally sourced produce wherever possible and are made using traditional methods. No artificial preservatives, colours or setting agents are used,” Theresa said. “Our relationship with the Milk Market goes back over 40 years. It was great fun growing up on a farm with parents who were really ahead of their time in practising sustainable living. We had all kinds of animals and produced all our own meat and vegetables. So it was a natural thing for me to continue with my own natural products. Theresa also produces books. The first of The Green Apron cookbooks Fruit on the Table: Seasonal Recipes from The Green Apron Kitchen was published in 2016 by The O’Brien Press. Critically acclaimed and a top 10 bestseller, it won a national award, and was also a finalist for the international Gourmand Award. © 2018 Milk Market Limerick. All Rights Reserved.